Well, like many other foods and beverages before it, this very old-fashioned way of drinking milk has received a very trendy upgrade. 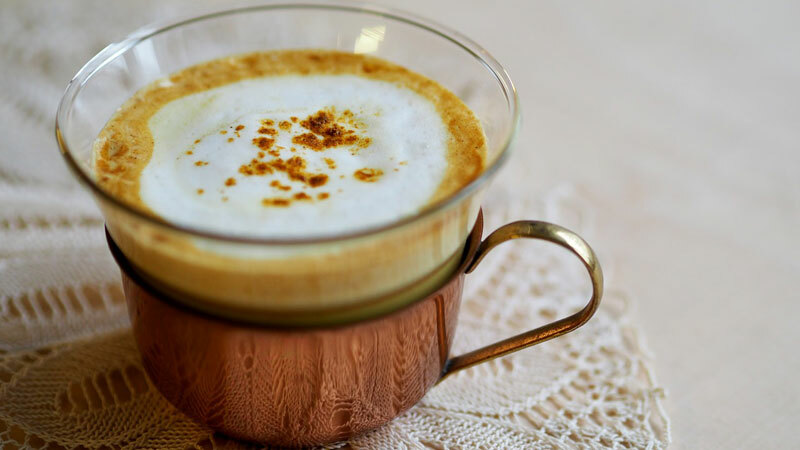 We live in a time when nothing today seems to go uncaptured; on Instagram or Twitter or Pinterest, and all are overflowing with posts particularly dedicated to this all-revitalized nightcap. Of course, it has a new name too – it’s called Moon Milk, with a few other healthful ingredients added in. Moon milk is all about warm milk, nutmeg, cinnamon, honey ground ashwagandha, as well as some colorful healthy floral ingredients like blue pea powder for instance, and herbs and spices like turmeric – all natural ingredients to calm and relax the body. Coconut oil is another must-have in moon milk which will do wonders for your health. Moon Milk, in all its trendiness might just sell itself purely by its name, but when you really look at it, you will find very convincing health benefits, and you might find yourself including it in your night-time routine if you are one, among millions of others, who have a hard time de-stressing, relaxing and dropping off to sleep in a couple of minutes. Milk in itself contains tryptophan and melatonin – natural substances that help people to fall asleep. The nutrients in moon milk are also known to be beneficial to your immune system. If the immune system is in good order, you can expect to fight off illnesses better. Depending on what ailments you have, will be what herbs and spices you will add to your moon milk so that your body can derive the benefits to match the ailments, while you sleep. Ashwagandha is a powerful adaptogen, working to improve and reduce the stress reactions you have at any given time. Ashwagandha offers calming effects. 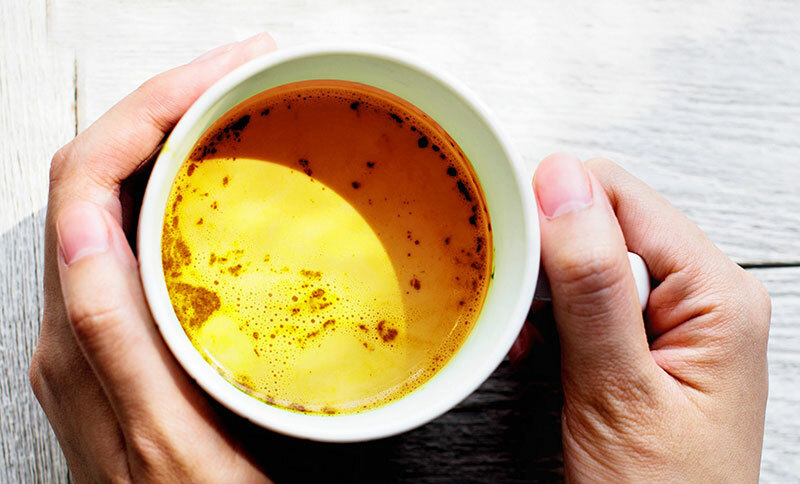 Adaptogens, too, have been used for thousands of years in Ayurveda and Chinese healing traditions and which are becoming very popular, mainstream ingredients for many health products today. Adaptogens are herbal supplements which mean they are derived from plants and which are nutrient-dense. Because people are so stressed out today, you can understand why adaptogens are so needed today to de-stress, to lower the blood sugar and boost the immune system. Ashwagandha is one of the most widely used herbs when it comes to Ayurveda medicine for most ailments in any case. As an adaptogen, its job is to bring your body into balance. It’s also known as a ‘tonic’ and nourishing herb; to have a rejuvenating effect in that it helps to support and protect the nervous system and immune system, and to improve energy. When you are in stressful situation, with Ashwagandha, your body adapts to the stressful condition. Ashwagandha also supports cardiovascular health. Adaptogens are unique in that they don’t just serve one function and the belief is that they actually can adapt to whatever your body is battling with, for example fatigue, anxiety or stress, lessening the symptoms. Other important adaptogens are Holy Basil which is considered a sacred herb in India. It is believed that this herb lessens stress. The other adaptogen is Rhodiola, often used in traditional Chinese medicine and known to support stress management. Another adaptogen people love to add to moon milk is Maca; shown to provide support for exhausted adrenals. The adaptogenic qualities found in maca help the body to normalize the cortisol levels, to reduce exhaustion from stress, and to protect the body against other effects of negative stress. A study published in Phytotherapy Research discovered that animals in a research program, when eating maca, showed reduced, if not abolished signs of ailments associated with stress. Maca has been known to reduce ulcers which we all know are stress induced. This herb is also known as Indian ginseng. Another name is winter cherry. It’s a member of the nightshade family, along with tomatoes, and has been used centuries back to aid relaxation. 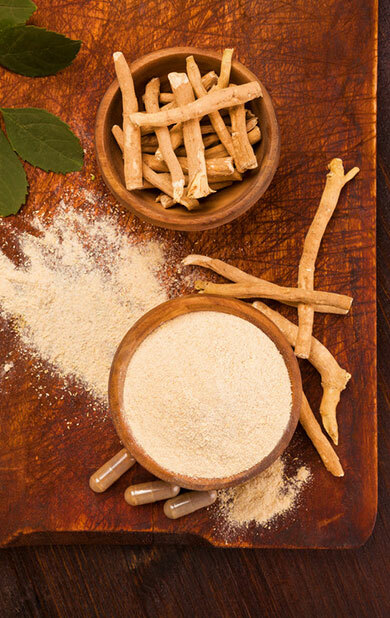 Ashwagandha is considered to be calming, restorative and grounding, supporting the sleep cycle. Ashwagandha offers great support in times of stress and anxiety because it has proven to promote good levels of cortisol, the stress hormone, as well as healthy inflammatory processes which get stimulated when undergoing stress. Ashwagandha also supports a healthy nervous system, promoting calmness and a stable mood, because the natural cortisol rhythms are regulated. 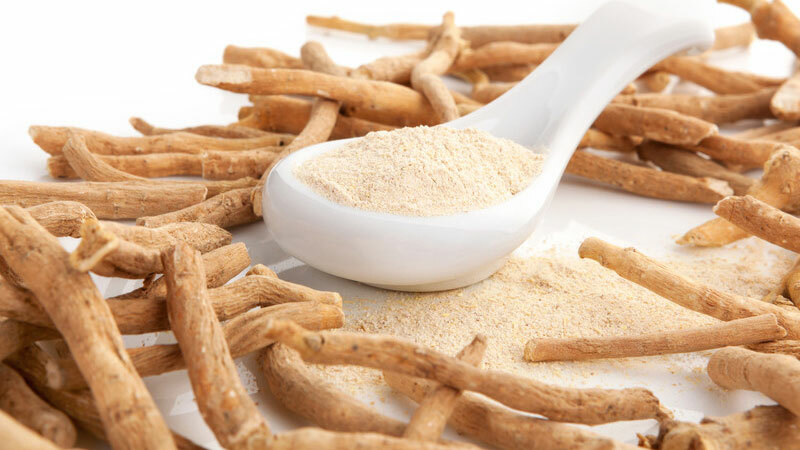 There are several studies showing how ashwagandha supports healthy sleep, improves reproductive hormones, supports healthy thyroid function, helps healthy muscle strength and recovery time. 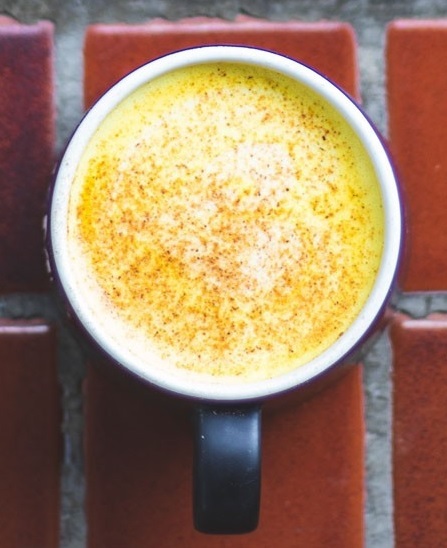 Another spice that makes up golden milk or moon milk is turmeric, probably one of the most widely used spice to fight inflammation. Turmeric (or Curcuma longa) is a wonderful bright yellow culinary spice, in fact, a relative of ginger. This spice has been used medicinally for centuries, highly prized for its antiinflammatory properties. The main component of turmeric is curcumin. Prevention of cancer: Turmeric has the ability to reduce carcinogenic levels which form when you eat meat that has been fried, boiled or barbecued, by as much as 40%. Prevention of Alzheimer’s disease: Turmeric forms a vital part of the Indian people’s curries that they eat it on a daily basis. 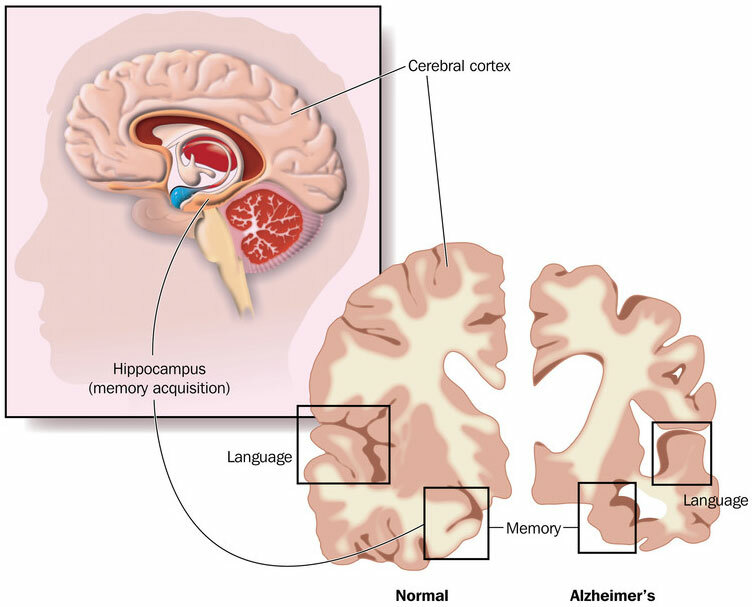 India certainly has a low Alzheimer’s disease rate – less than one-fourth the rate of Alzheimer’s disease found in the US. 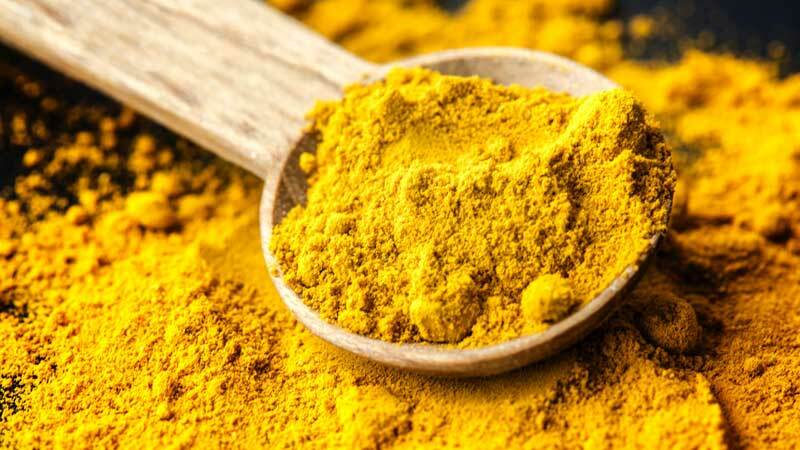 It prevents skin cancer: The curcumin is noted to inhibit the growth of melanoma, which is the most serious and potentially dangerous type of skin cancer. It relieves arthritis pain: Turmeric contains many anti-inflammatory compounds, and studies show just how positive the changes are in arthritic patients. Very useful as an anti-depressant: Other spices which can be used besides or including turmeric can be nutmeg, cinnamon, ginger, or dried lavender, all very popular. Whereas cinnamon and nutmeg might be very calming and warming, ginger is the one that helps with digestion problems. Look out for lavender too, known for its super relaxing properties. Nutmeg: When you use nutmeg sparingly you get just a perfect spicy note without it being too overwhelming if you add too much. Cinnamon: This is probably the most popular spice, giving your moon milk a lovely, strong, sweet flavor. Cardamom: Cardamom is very aromatic, with woody flavors, adding a pungent note to the moon milk, but it pairs wonderfully with nutmeg and cinnamon. Allspice: The dried berries from a plant called the Pimenta dioica make you think of cloves, cinnamon, pepper, and nutmeg. Even though the below superfoods are not the typical ingredients that constitute moon milk, being trendy is ‘in’ at the moment regarding superfoods so you can go one step ahead and use these to supercharge your moon milk. Blue Majik powder: Just a spoonful of blue algae powder which is made from spirulina, the blue-green algae, which will give your moon milk its blue sea color. Pomegranate: Pomegranate is a fruit that represents fertility and health and eternal life and many an ancient religion. Adding a scoop of pomegranate powder into your moon milk is a fabulous addition. 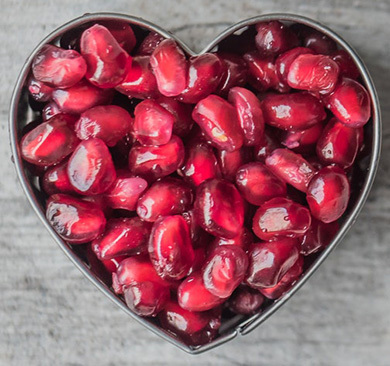 Pomegranates have antioxidants, good amounts of vitamin c, aiding in digestion problems and helping with arthritis, cancer and Alzheimer’s disease, among others. Moon Milk is trending right now, and this is thanks to its fantastic therapeutic and detoxifying benefits, let alone that it is such a soothing tonic, helping you simply to de-stress and give you a wonderful night’s rest. Have you started to drink it daily? Even though there are many variations of this potent liquid, most of them follow the same basic guidelines, one of which is drinking it with the traditional cow’s milk. 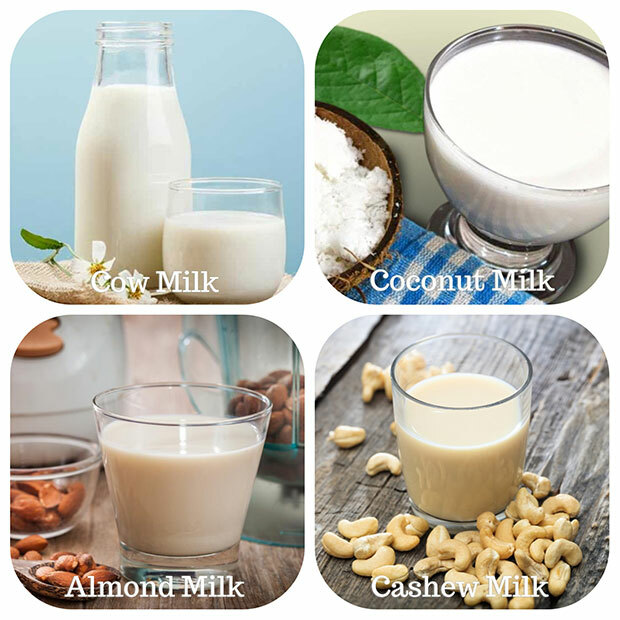 You can change your cow’s milk by using cashew milk, almond milk or coconut milk. Ayurveda does teach though that only boiled milk should be used for your moon milk because this is what decreases mucus production and also enhances the digestive function better than when raw milk is used. Traditionally, you will use whole cow’s milk to make your drink, but if you are not a fan of dairy, you can still enjoy the benefit of moon milk by substituting with other products. In fact, moon milk isn’t the latest and greatest non-dairy milk alternative drink that you need to buy at your expensive health shop. Cow’s Milk: In Ayurveda, which is an ancient system of natural healing; drinking warm milk is a typical well used remedy to counter sleeplessness. Using cow’s milk will keep your moon milk classic and if you add real organic, creamy milk, you will notice a difference in the richness and flavor. Coconut Milk: Choosing coconut milk, you will achieve quite a creamy vegan flavor and you get 2 g of protein per serving. Almond Milk: With almond milk, your moon milk will get a nice nutty flavor. Cashew Milk: Add cashew milk if you like, and as it has a neutral flavor, it won’t upstage all the other spicy flavors you have added. Coconut oil is a true key player in a moon milk recipe. Its healthy saturated fats are capable of helping to protect the brain from degenerative diseases such as Alzheimer’s. It also helps to keep you feeling less hungry and goes so far as to help you lose weight. 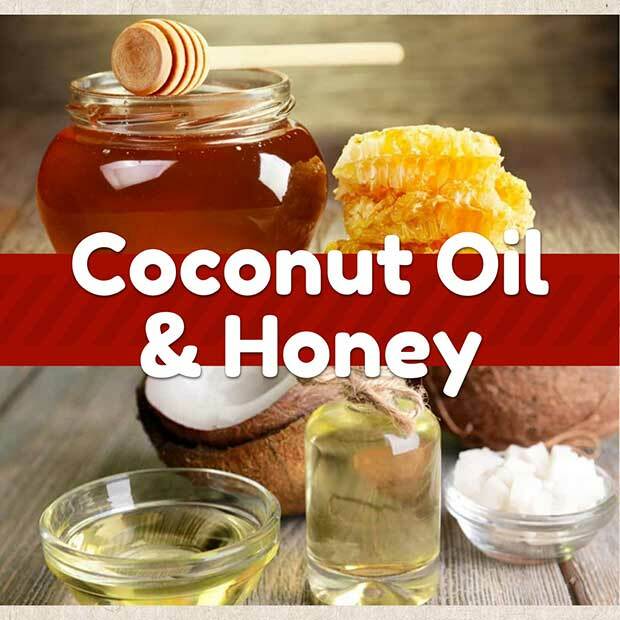 Coconut oil has antimicrobial properties so it is considered the perfect food for maintaining top gut flora balance. Honey: It is best that the honey added to your Moon Milk is raw honey and that the spices added are unrefined spices. The benefits of honey are endless, relieving you from stress and anxiety, giving you peace of mind and restful sleep. Each of the ingredients in moon milk does have their own sleep-inducing qualities, even though many people believe that the overall effect of moon milk could be, in part, a bit of a placebo effect. But in fact, everything we do has some level of a placebo effect, whether it is going to the doctor, meditation or drinking a medicinal elixir like moon milk. When we believe that something works and we are even emotionally invested in it, our inner emotional state and biochemistry changes to support it. The key to health though is creating healthy habits and rituals which will help us to stay in sync with the natural cycles and flows of nature. So then, if an aromatic, warm drink is your cue for you to relax and get a good night’s rest, then moon milk is really and truly worth the try. Simmer milk in a small saucepan over a medium-low heat. Then whisk in turmeric, cinnamon, ashwagandha, ginger, and cardamom, and nutmeg; seasoning with black pepper. Whisk vigorously so as to avoid any lumps and clumps. Next, add the coconut oil, reducing the heat to low, and then continuing to cook until warm; about 5-10 minutes, because the longer you go, the stronger the medicine is. Then remove from the heat and allow it to cool. Stir in the honey. Don’t cook the honey because honey that is cooked loses all its healing goodness. Then pour into a mug, drinking it warm, and then go to bed and allow yourself to be shepherded into Dreamland. Many ask the question – is moon milk actually going to help me sleep, or is it really all about excellent Instagram posts? A certified culinary nutritionist called Neda Varbanova says that it is the adaptogens that are added to moon milk which will promote relaxation. Milk also contains tryptophan and melatonin, the natural substances known for inducing sleep. A core principle of Ayurveda is to find harmony for the mind, soul, and body and that means that good sleep is very important to achieve that. That is why moon milk came about, because of its high praises for being able to relieve stress. So when it comes to getting some shut-eye, everyone has learned about the calming effects of a warm cup of milk. To make just the basic moon milk, all you need do is stir up some of the amazing ashwagandha powder into a cup of warm milk and that’s it.